The first Mass at St. Mary of the Annunciation was celebrated on Christmas Day 1865. The church was built hill on a parcel of land donated by the Superintendent of George’s Creek Coal and Iron Company. The building was started in 1860 but was delayed by the Civil War. The building was fashioned from the wood and stone from the surrounding mountains. Prior to the building of St. Mary Church, Mass was celebrated at the “stone house” in Knapp’s Meadow, sometimes by John Neumann, who become the first American saint. This pen & ink line drawing commemorates the final days of it’s existence. Torn down in August 2013, St. Mary of the Annunciation Parish will fade into the history of America, but will always be in the hearts of her flock. 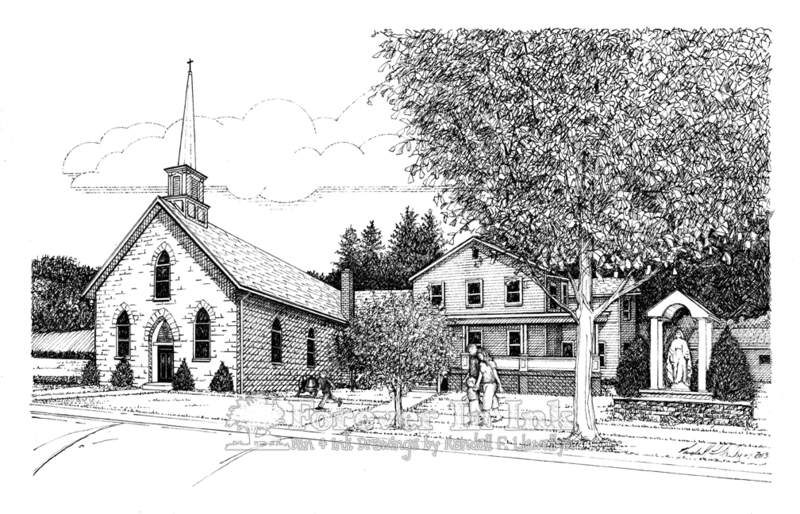 This entry was posted in Artwork and tagged Church, Drawing, Line Art, Lonaconing, Lonaconing Maryland, MD, Parish, Pen & Ink, Pen and ink, St. Mary, St. Mary Of The Annunciation Parish. Bookmark the permalink.